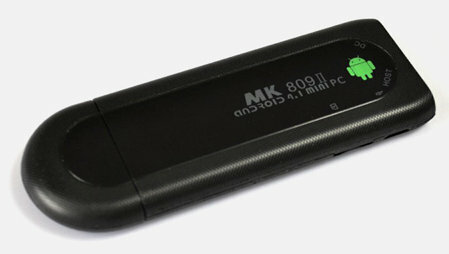 Kimdecent announced it started to sell MK809 II mini PC with Rockchip RK3066, 1GB RAM, 8GB Flash and built-in Bluetooth. This HDMI TV dongle is very similar to Rikomagic MK802 IIIs in terms of specs, and I’ve been told the user interface is also nearly identical. The package includes the power supply, a USB cable, and a user manual in English. This is basically the same specifications as UG007, except MK809 II has one extra micro USB port. The device also features a software power button missing in many devices. Even though some developers are working to port Ubuntu to Rockchip RK3066 devices, don’t expect to be able to do too much with Linux, as GPU and hardware video acceleration won’t be ported to Linux due to a complete lack of open source (and even binary) drivers. It would still possible to use it as a small Linux server however. MK809 II can be purchased on Aliexpress for $56 on Kimdecent store, but other Aliexpress sellers also offer it at various prices. You can also get it for $5 less with “mainagame5″ coupon.